Never Give Up: Why Do We Care About Saint Joseph? 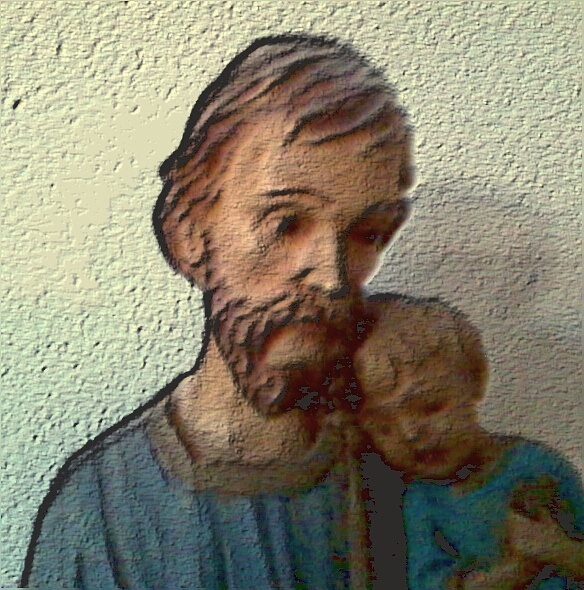 Why Do We Care About Saint Joseph? Because March 19 fell on the Third Sunday of Lent this year, the liturgical observance of the Solemnity of Saint Joseph–a great holiday in the church year–was transferred to today. Many people (especially those of Italian heritage) celebrated and observed the traditional customs of St Joseph's day yesterday. In Italy and other countries in Europe, St Joseph's day is also "Father's Day." The good news is that we may continue celebrating, indeed we must celebrate. Today is one of only two days during the Lenten season when the Gloria is sung in the Roman liturgy. So please, keep celebrating! And as much as Italians (or, rather, we Italian-Americans) would like to "take over" the observance of this day as "our St Patrick's Day" (😉) we must remember that this celebration is truly for everyone. St Joseph is "Patron of the Universal Church" and a father to each one of us in a special way. His place at the heart of the Communion of Saints stems from the central role he played in the plan of salvation. In recognizing the miracle of the Incarnation–God's coming to dwell with us in the virginal womb of Mary–Joseph also embraced his own role as foster-father, and assured God's fulfillment of His covenant with Israel by giving Jesus legal title to the lineage of David. Joseph is also close to each one of us in a personal way. The New Testament conveys only a few details about him (and no spoken words), yet what emerges is a vivid and dramatic humanity, a man who fulfills his unique vocation faithfully. Joseph's fidelity is exemplary for all of us. No one knew better what it was like to be overwhelmed by the Mystery of God and the smallness of one's own self, but Joseph trusted in the goodness and mercy of the Lord and followed Him. He was given enough light from God to take the next step in every moment of a journey through life that was wondrous and incomprehensible, sometimes dangerous and filled with precious responsibility but also overwhelmingly mundane. After what might be called "the excitement at the beginning" of his vocation, most of Joseph's days were full of hard work in a small Palestinian village where everybody knew everybody else's business, where people lived crowded together in interconnected family groups. St Joseph continued to live faithfully this life filled with work and many cares, doing countless little tasks, and growing tired at the end of each day. He was responsible for the Son of God and His ever-virgin mother Mary, and the Holy Family was no doubt profoundly, uniquely loving and sustaining. But he also probably had a share of responsibility for other relatives, nephews and nieces, cousins and such–especially those who were fatherless. According to the wider family customs that still prevail in many Semitic cultures, Joseph would have taken care of the children and the widows of his brother or brothers if they died before him. 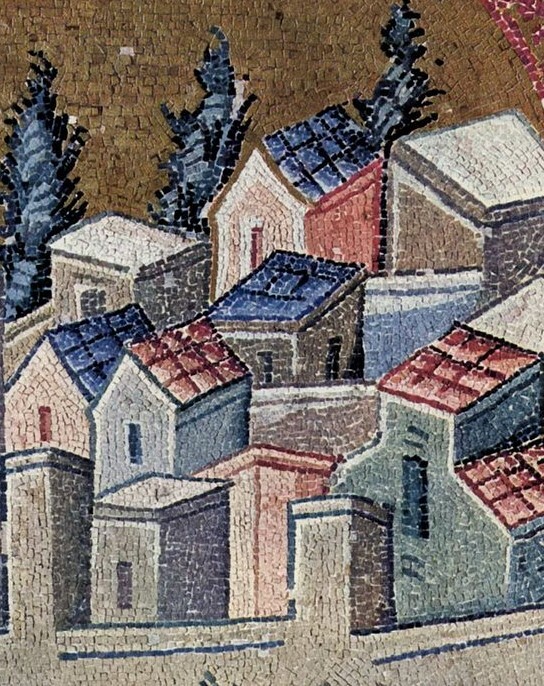 Nazareth, detail from early medieval mosaic. This love gave Joseph plenty of experience of the human condition, plenty of opportunity to deal with people's problems, mediate their disputes, and put up with all their peculiar quirks. Joseph loved and served ordinary people with all their stubbornness and pettiness, day in and day out. This called for a courage far greater than he needed to escape from Herod with the baby Jesus and Mary. 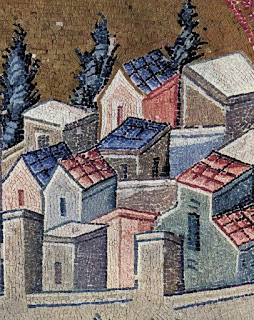 In his vocation in life, Joseph was responsible in so many ways, on so many levels, for building up the first concrete human community in which God dwelled. His life has borne fruit in eternity as he continues to have a unique role in building up the communion of the Church where the risen and glorified Jesus dwells. His paternal solicitude continues toward each of us. His quiet attention, his diligence, his fidelity accompanies us in our own journey through this life. This is not some independent action that he does "in addition" to Jesus or "outside of" Jesus, but precisely within the communion of persons that is generated by the loving heart of Jesus. Let us turn to St Joseph with all our needs and concerns in life. Indeed we should turn to him with gratitude, because he has already done for us in Christ more than we can imagine. On this day, especially, let us celebrate this strong and tender man who is a gift of God's love to all of us. Eileen's Treat: TWO Hockey Games! Mary's Unique Name: The "Grace-Filled One"
The Big Storm... Was That It? Hot Coffee Will Wake You Up! Does the Search for "Clarity" Hold Us Back?